Not long ago I received a response from a Freedom of Information Act (FOIA) request I sent to the University of Connecticut. The institution is the home of the Gatorade-founded Korey Stringer Institute (KSI). KSI’s CEO, Doug Casa, has been previously featured on our blog as a promulgator of hydration guidelines that encourage athletes to drink beyond thirst satiation. Casa continues to cite these guidelines despite the fact that a scientific consensus statement from the world’s foremost researchers states that the best way for preventing excessive dehydration and deadly exercise-associated hyponatremia is drinking according to thirst, not beyond or before (1). The University of Connecticut also has the distinction of being a former employer of Dr. William Kraemer, editor-in-chief of the National Strength and Conditioning Association’s Journal of Strength and Conditioning Research, and author of the infamous CHAMP document designed to harm CrossFit’s reputation among military leaders (2). If you don’t know why that’s important, you’ve probably been living under a log. The response I received from my FOIA request gives a glimpse into the attitudes and perspectives of the KSI’s top officials. The picture these emails paint is disturbing. 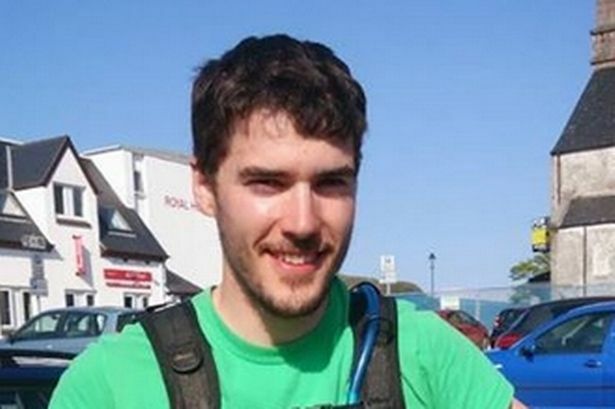 Iain O’May died in 2015 from exercise-associated hyponatremic encephalopathy. Exercise-associated hyponatremic encephalopathy is caused by a decrease of blood-sodium levels during exercise. While Gatorade-funded organizations such as KSI have consistently argued that this is the result of consuming too little sodium during activity, there is virtually no evidence that this is the case. Rather, scientists have consistently found that overconsumption of fluids during activity is the root cause of EAH (3). Imagine you have a 30-gallon saltwater fish tank. In order to thrive, your fish need water that contains the right amount of sodium. You put 15 gallons of saltwater that is just the right ratio of salt and water for your fish into your fish tank. Next you dump 15 more gallons of water into the tank, but this water contains little to no salt. Your fish die. While it is technically accurate to say that the fish had “too little sodium,” this ignores the causal mechanism that led to their death–adding huge quantities of fresh water to the aquarium and diluting the overall sodium in their tank. This is essentially what organizations such as KSI overlook when they mischaracterize deaths from EAHE as the result of “too little sodium.” The reason this is so disturbing is that KSI, and particularly KSI president Doug Casa, consistently promotes the overconsumption of fluids that leads to EAH-related deaths (4). In the screenshot below, we see an email sent by Laura Kunces to four other KSI staff members. The email contains a report on the death of Scottish Ironman competitor Iain O’May, who died of EAHE. Robert Huggins, KSI Vice President of Research, responds by sarcastically mocking those who would attribute O’May’s death to overhydration. In particular, he jokes about “Waterlogged,” by Dr. Tim Noakes, the scientist who was first to expose the dangerous problem of overhydration encouraged by Gatorade and its proxies in academia. What does this tell us about KSI? Though this is only one email, it reveals that KSI staff are ultimately indifferent to the news that an endurance athlete has died. Rather, they seem to default to defensiveness and mockery of those who would attribute that athlete’s death to the type of hydration guidelines promoted by KSI. At this point, some might argue that this is simply one email written in poor taste. 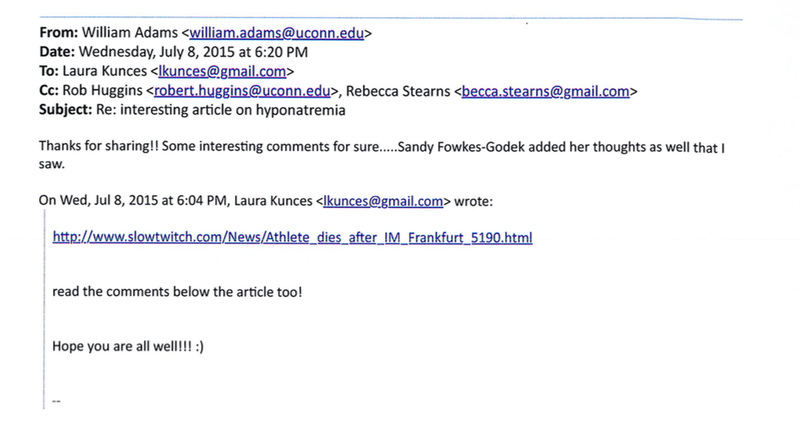 Could there be an email in which these same officials turn to the serious discussion of how their organization’s hydration guidelines might contribute to EAHE deaths in athletes such as O’May? 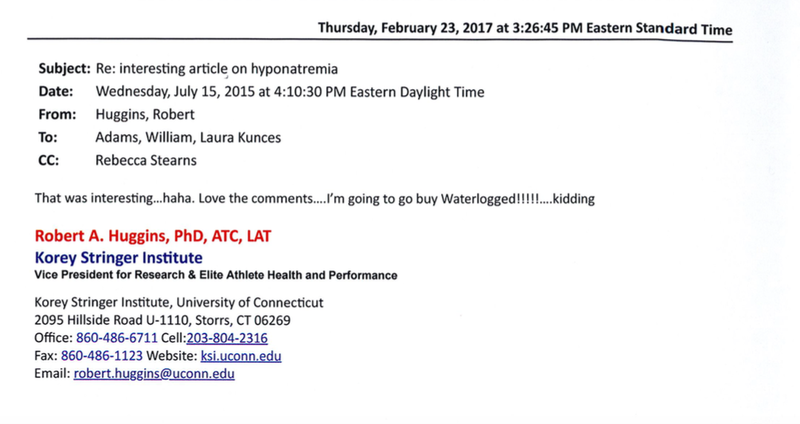 Is it possible there are unseen email exchanges in which the officials seriously interact with critics and reflect on how they could improve their position on hyponatremia? If there were, such emails should have been part of the response to the FOIA request, and it seems unlikely KSI would limit their response to only the emails that make them look callous and self-concerned. As it stands, the information we have presents a snapshot of KSI’s internal culture that is less than comforting. Korey Stringer Institute: Obfuscation, Corruption and Death, The Russells Blog. The NSCA’s William Kraemer vs. CrossFit Part One, The Russells Blog. Statement of the 3rd International Exercise-Associated Hyponatremia Consensus Development Conference, Carlsbad, California, 2015. British Journal of Medicine. The problem is also known as water poisoning, with some of the more spectacular cases occurring in mental institutions (of course). The earliest treatise on the subject I could find is Rowntree, L.G., Water Intoxication*, Arch.Int.Med, August, 1923. His asterisk points to this: “‘intoxication’ as used here designates poisoning”. I especially appreciate that because strictly speaking, toxin, the origin of the word, refers to a poison produced by an organism. Sugar, for example, is therefore not toxic, but evidence supports that administered for a long enough period is a poison. References to hysterical words like toxins, drugs, and addiction have hysterical advantages in advocacy, but misused become noise in science. Science prohibits little, but if a word has less than an authoritative meaning, the treatise is obliged to give it a stipulative definition. Hydration became a treatment for heat stroke, based on the mistaken theory of homeostasis. The conjecture was to bring down the body’s core temperature to a “desirable”, meaning homeostatic, level by administering fluids. Since that time, physiologists revised homeostasis first to heterostasis and then to allostasis. Articles still appear based on homeostasis. We now know that the normal body changes its core temperature to shed excess water, or any water it can spare. Hydration is contraindicated in cases of heat illness.